Live in LA’s next great city! No HOA and a Walk Score of 87! Imagine summer evenings BBQing on your private rooftop deck enjoying music, drinks and expansive jaw dropping views! This upscale no maintenance community features only 24 single family homes. Location is why many people are saying Highland Park is the next great city in LA. 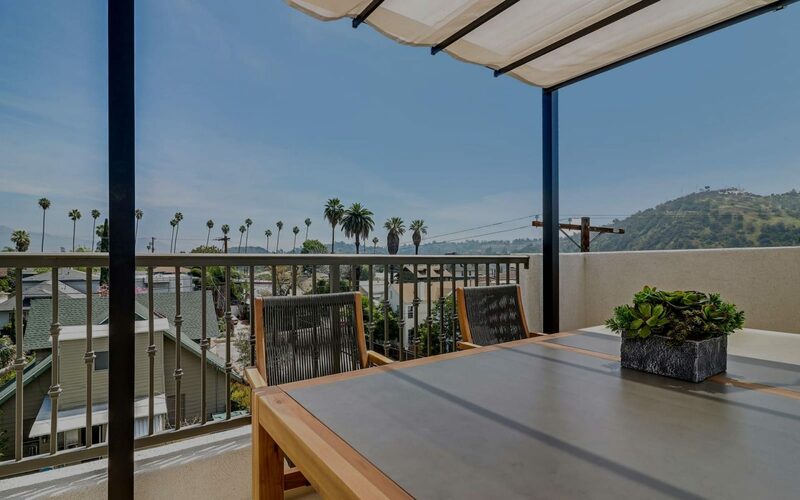 Located just 6 miles from both Downtown LA and Pasadena which are both easily accessible by jumping on the 110 Freeway or by walking to the Metro Gold Line. Just a short walk to Highland Park Bowl, Civil Coffee, Highland Theater and dozens of restaurants, cafes and trendy shops. Echo Two Four is a community of brand new homes with designer premium finishes. You can feel safe knowing your new home is built to all the most current and strict building codes along with the latest technology including home automation and security. The ground floor provides a bedroom with a full bath and 2-car direct access garage. Upstairs, you have a spacious dining area with lots of windows and light, family room with a large balcony and your dream kitchen with GE Monogram Appliances and farm sink. On the third floor you’ll find 2 master bedrooms. One more flight and you’re on top of the world on your rooftop deck with expansive views including Downtown LA! This home is available now and ready for you to pick up your keys in just 30-45 days. Don’t wait because this opportunity will be gone soon! Residence One at Echo Two Four is 1,962 approximate square feet with 3 bedrooms and 3.5 bathrooms. Featured is an attached two car garage, second-floor deck off the great room, dual master bedrooms, and a private rooftop deck on the fourth level with Downtown views. Residence Two at Echo Two Four is 2,055 approximate square feet with 3 bedrooms and 3.5 bathrooms. Featured is an attached two car garage, second-floor deck off the great room, dual master bedrooms, and a private rooftop deck on the fourth level with Downtown views.